Hemel Town boss Joe Deeney. (File picture by Marc Keinch). Hemel Hempstead Town’s season continued to dawdle to an uninspiring conclusion when they drew 1-1 at home to relegation-threatened Truro City at Vauxhall Road on Saturday. It was a massive point for Truro and one they just about deserved in a forgettable game that meant far more to the visitors, who were languishing in the bottom-three before kick-off, than it did for the Tudors, who are tucked safely in 14th place. The first-half saw City start well and create some decent chances, Niall Thompson blazed the ball over the bar as early as the first minute after being put in behind Hemel’s back-line. That was pretty much the story of the half, with Truro playing neat and tidy football with little or no cutting edge. They were made to pay for this when Hemel took the lead somewhat against the run of play in the 23rd minute when Herschel Sanchez Watt guided a header home from a Jordan Parkes corner for the striker’s eight goal of the campaign in all competitions. That was just about it as far as chances went in the first period and the second followed in much the same way. Truro huffed and puffed, but created nothing, while Hemel relied on rare counter attacks. The hosts probably should have extended their lead when Danny Rowe raced clear on the hour mark but his first touch let him down and Alexis Junior closed him down. As the clock ticked down, most Hemel fans were looking at their watches, knowing that despite defending against a toothless attack, their side were more than capable of presenting them with an opportunity to equalise. Just when it looked as though they would hang on to all three points and with only a minute remaining, the inevitable happened. Hemel conceded a sloppy free-kick, some distance out, on the right-hand touchline so it shouldn’t really have caused a problem. But as the ball was fired into the box, it evaded everyone except an unmarked Jared Lewington, who rose and joyfully headed the ball past keeper Laurie walker to give City a share of the spoils, much to the delight of a decent band of Cornishmen behind Walker’s goal. There were one or two worries that the Tudors would completely mess things up and lose the game, but in the end it petered out and the spoils were shared. 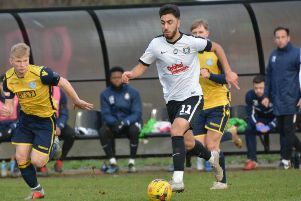 The point moved Truro out of the bottom three, while Hemel remain fixed in 14th place in the National League South for the sixth week running. Just three league games remain for Hemel, but they turn their attention to cup action this Tuesday night when travelling to Hertford Town in the Herts Charity Cup. The Tudors then visit playoff-hopefuls Billericay Town, who are in sixth place, this Saturday in the league. Hemel: Laurie Walker, Joe Howe (Darren Ward), Kyle Connolly, Jordan Parkes (captain), Jacques Kpohomouh, Tom Hamblin, Keiran Monlouis (Mark Randall), Kavan Cotter. Arel Amu, Herschel Sanchez Watt (Jason Williams), Daniel Rowe. Subs not used : Jack Snelus, Danny Boness. Tudors’ man of the match: Tom Hamblin.